[had never] seen a White Man, & has only seen two vessels since he has been here. He is quite rejoiced to see his own native people Once More – Never having expected to meet with any [again]. Todd's journal is one of the key sources that proves John Batman wasn't at Indented Head when Buckley appeared to William Todd and Batman's men. There are also various explanations as to why Buckley left the Wathaurung. Todd's journal suggests that it was because Buckley saw there was a threat to the settlers and he couldn't watch them be ambushed by the Aboriginals. Whatever his real reason, Buckley left with the settlers and worked in Melbourne as a labourer, building Batman's house on the hill where Southern Cross Station is today. 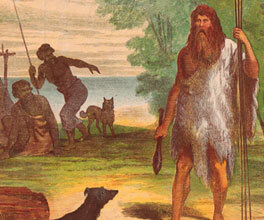 He also became an interpreter and mediator between Europeans and Indigenous people. ... when I reflected on the suspicion with which I was viewed by the most influential white men, and on the probable doubt the natives would entertain in my sincerity after having left them, I thought it best to retire to Van Diemen's Land. Morgan, J 1852, The life and adventures of William Buckley, Archibald MacDougall, Hobart, Tas. One of the key events leading to Buckley leaving Melbourne was the disappearance of his friend Joseph Tice Gellibrand. When Buckley tried to search for Gellibrand, he found his horse injured. The public judged Buckley harshly for his apparent disinterest in finding his friend and his relationship with local indigenous communities. Buckley left the colony after only two years, arriving in Hobart Town in early 1838. He married widow Julia Eagers in 1840, and lived a relatively quiet life until his death in 1856. A chance encounter led William Buckley to a new life in an Aboriginal community.